Balance in life can be measured or segmented in many ways. My formula for balance involves the four Rs. These are relationship, rest, recreation, and refreshment. See the diagram below for how these lend to balance. These are areas of the self that need our utmost attention. As these areas start to come into balance, other areas such as work, finances, etc. can be addressed, although commonly they are addressed simultaneously. This blog only addresses the self and balance. 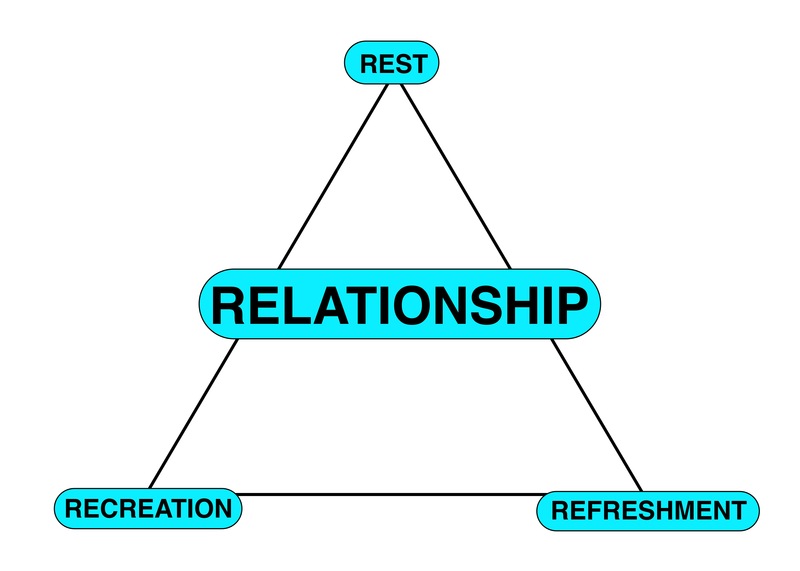 The next most important area for balance which is at the top of the triangle is rest. Without rest, things quickly fall apart. Recreation and refreshment have about equal weight in terms of balance. By recreation, I mean time spent recharging our batteries as well as time spent on exercise, so really two areas for the price of one R. With refreshment, I mean the food that sustains us, our nourishment. So these are the four Rs. Now I’ll delve into three Rs that make up the points of the triangle. Information on dietary guidelines can be found at http://www.cnpp.usda.gov/default.htm. For a BMI calculator to determine your ideal body weight, please go to http://www.nhlbi.nih.gov/health/educational/lose_wt/BMI/bmicalc.htm. Lack of balance with the four Rs can lead to problems with health, relationships, employment, etc. I will discuss how to regain balance in these four areas in my blog next month. Please feel free to post your questions and comments below. I will be writing a short blog post monthly beginning on March 1st. Please leave your suggestions below on topics that you would like to see covered on this blog. To receive a daily Pearl of Wisdom, please ‘like’ my Facebook page or follow me on Twitter. Please note: Information provided on this site is for educational purposes only and is not meant to treat any health conditions or to be a substitute for seeking care from your personal healthcare provider. You are currently browsing the Pearls of Wisdom Consulting Services blog archives for March, 2012.